President, Nick, next to District Winner, Abigail and Special Achievement winners, Grace, Mary and Henry. There were 29 entries from Sir John Nelthorpe School using the theme, “The World is Beautiful”. 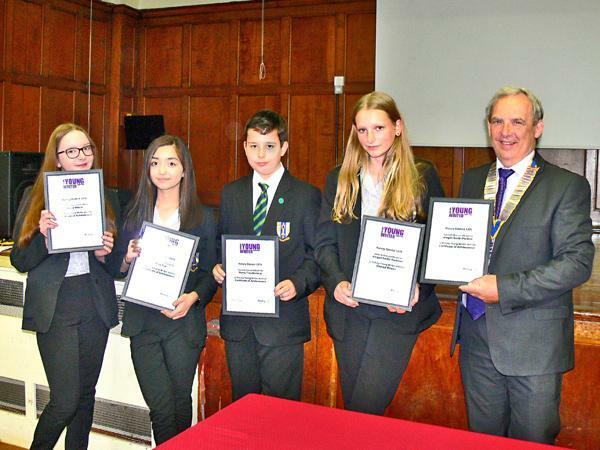 Four of those entries were judged to be worthy of a Certificate of Merit and one of them was selected as the District 1270 overall winner. This entry went forward to the Great Brittain and Ireland finals. The young people were Grace, Mary, Henry and winner Abigail pictured next to Brigg President, Nick Wells. This is a tremendous achievement and President, Nick, at a special school assembly, congratulated teacher, David Waite, and his pupils then awarded certificates to the district winners and all entrants.